I just got an email from SeeMeFPV (woo!) announcing the availability of multirotor parts on their website. My question is - as someone who knows nothing about anything but is interested - what's missing to go from zero to flying? A couple things that jump out at me are batteries and controllers. Frame obviously, but I assume you can 3d print one. What else? Re: What's it take to build a multirotor? You'll need a TX and an RX, a frame, batteries, miscellaneous wiring. If you want to do FPV, a camera and a camera TX, and an accompanying display device (usually goggles) with an appropriate receiver. 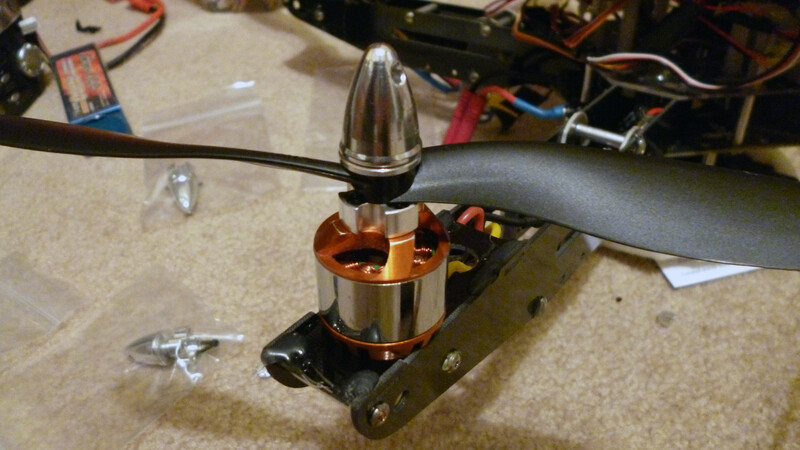 If you've never built one before I'd recommend you start with a kit of parts, multirotors are an easy build if your comfortable with soldering and you bear in mind that everything is subject to significant vibration when it's running. But the first time you have to wire one it's nice to have instructions to understand especially how to wire and configure a flight controller, and the TX. If your not used to RC gear it can be pretty intimidating. I have probably half a dozen multi-rotors, several with FPV setups installed, I really like the NAZE32, but you should watch one of the You tube videos and see how much of the setup process makes sense. No one is going to be able to help you fine tune your PID settings, because they very a lot based on the setup. I did this over the last year, having never worked on anything RC before that, so I got a good crash course (literally, right?) in what's in a multicopter. Luckily there are a lot of places to find information. Polygon and Earthbound have listed the bits that you need quite nicely. My problem starting out was that I didn't know what each of those pieces were. I found a build on Instructables from TogleFritz that is absolutely excellent - one of the best write-ups that there is. http://www.instructables.com/id/A-SK450 ... -Your-Own/ Use a how-to like that as your guide and you'll be ok.
Basically the motors, prop adapters, and props go together as you'd expect. The other electronics are built around the flight controller. The radio receiver feeds it your controls from the radio, and it send out "instructions" to the ESC's (electronic speed controllers) that power the motors. There's also power distribution, straight from the battery to the ESC's, and through a "BEC" (battery elimination circuit) that steps the voltage down to power the flight controller and radio receiver. At a high level, that's all there is to it. Each piece has its intricacies and pitfalls, but there are idiots that accidentally get this right every day, so you'll be completely fine! That great addition. If someone from Admin want to transfer my thread from "What are You Making" to here i will be much happy. My Thread name is " My Quadcopter Build"
Definitely would go a kit for the first one. Even a super cheapie one just to get it all lined up in your head. Get a simulator. Pay for it if you have to, but think even if it costs a hundred bucks it's still cheaper than your first crash. Preferably get one that you can control in trainer mode with your transmitter so you get a feel for the controls instead of a mouse and keyboard. Log some bulk hours on that thing. As someone who spent some time as a demo pilot and tech crew for military drones in the past I can tell you, making most of your rookie mistakes (spelled "c.r.a.s.h") on the simulator is going to save you a world of pain, time and money when you get your baby spinning up. Polygonhell wrote: and you bear in mind that everything is subject to significant vibration when it's running. Especially significant vibration when you run it into a wall, tree or the ground! I flew RC helicopters for many years. That was one of the most expensive hobbies ever. The level of skill it took to fly (this was before gyroscopes and heading holders) was incredible. Just when you thought you had it, kaboom, something happened and you ended up with a pile of parts. The multirotors are much easier to fly but there is still a learning curve and there are airspace rules and frequency rules to follow. I lost more than one helicopter, due to vibrations and poorly thought out installations, I lost one to a lack of thread-lock on a piece in the rotor head when one rotor just folds up, it's kind of hard to fly, I also lost one because the wiring was passing over a corner on the aluminum frame and with the vibration it cut though the insulation on the wiring resulting in a short, and me losing control of the helicopter. If your wings are moving faster than your fuselage, you're in a helicopter and are therefore experiencing an unsafe condition.